DO WALLEYE HAVE WINGS? THEY SURE DO! Walleye DO WALLEYE HAVE WINGS? THEY SURE DO! Now that Walleye fishing has been fantastic I thought I would Repost my March 20th Thread "IT’S NEAR TIME FOR DELICIOUS WALLEYE WINGS"
Yes, Walleye do have Wings. It's the Chin or Breast Meat. For years, anglers and consumers have known about the delicacy of walleye cheeks, but are now learning of the new rage of Walleye Wings. It has taken many years for Walleye Cheeks (the filet mignon) to go mainstream which are now sold at many Fish Markets, in time I expect Walleye Wings to do the same instead of being wasted by the ton or going for Cat Food. If you haven't eaten any you will find that they are good as Cheeks and if not better tasting. Several years ago (well over 25) I read an article in OOD Magazine on how to cut out and cooking "The Pecks" (now called Walleye Wings and also known as Chin & Fins, Bat Wings, Wishbones and Rabbit Ears). I had a copy of that article and showed it to numerous other Walleye Fishermen over the years to get others eating this delicious part of the fish as I have been doing since reading that article. It’s a shame how many of The Pecks (Walleye Wings) go to waste each year when the public could be enjoying this part along with the Cheeks. If you have never heard of them, it is the “V" under the gill plate that is normally tossed out with the head after you fillet the fish. When the Wings are cut out with the Pelvic/Ventral Fins, then cut between them on the larger ones so you have two Fins and what you'll notice is a big hunk of meat attached to each. The Fin can be used as a handle. The bones are larger and somewhat flat and easy to pull out as you eat them. The meat is very sweet, and makes an awesome appetizer. You can bread'em, fry'em, saute'em, grill'em, smoke'em then coat them in whatever your favorite Dipping Sauce is for Fish. Cocktail or Tartar (preferably homemade) or even Ranch or Dill Dressing. If you Grill"em, season with a little Alpine Touch and Cajun or your favorite seasoning. Dip in Drawn Butter. I learned from that article to make the “V” cut which only takes seconds, which includes both Pelvic/Ventral Fins as shown in these YouTube Videos. Recently, in March of this year I thought I would Google "Walleye Wings" looking for additional information and I find a Company from Kenora, ON called Walleye Wings Inc. who has a Website and Facebook Page. They have taken Walleye Wings mainstream with Packaged Breaded and Smoked Walleye Wings and currently distribute to several restaurants, grocery stores, lodges and gas stations in the region. The Company trademarked "Walleye Wings" on June 16, 2010. If you are now enjoying Walleye Wings, please tell all your fish'n buddys that don't utilize this part of the Walleye and have them read this article and check out the YouTube Videos. I do hope more Walleye fishermen will be enjoying their Wings this upcoming Walleye season. Please Post your thoughts on this Thread once you have tried them. The first I ever heard of it??? I cant even imagine how many pounds of these I've wasted over the years!! no more that's the part Dad Gets. Was out on Monday Seamaster from SP. Have been doing pretty well a mile to a mile and a half from the fence off evangola in 70-75fow. for the past couple weeks. Marked a bunch from 55-65fow. Pink rats have been doing the most work, however when it clouded up on Monday I switched silver and blue shallow divers on 10 color and they picked up a bit. I took 8 nice eaters on Monday. Probably could of done better if I ran some meat but didn't feel like dealing with the mess. I hear they are still down my well out of Dunkirk too. Hope this helps. Good Fishing!! Son winched in this nice slob. Tried them this week. O MY GOD THERE GOOD!! I've been preaching that for years. 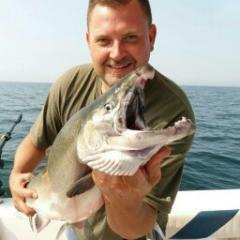 In 2015 I did Post about Walleye Wings on a couple of Canadian Fishing Forms (I'm a Canuck) This past Spring I even contacted the Ontario Commercial Fisheries' Association http://www.ocfa.ca/ and Member Walleye Processors on the feasibility of utilizing Walleye Wings just like the Processor from Kenora, ON. Chicken Wings have flown the coop and Walleye Wings™ are the new catch of the day. Freshwater Cuisine from Northern Ontario is on a mission to reduce waste. They transform under-used fish species and parts that fishermen throw away into mouthwatering morsels. Seriously crunchy and meaty! www.freshwatercuisine.com It was disappointing when I didn't get a response. One of their Commercial Members from Killarney, ON has 2 Fish and Chips Stores. I Emailed the Owners back in April suggesting they add Walleye Wings to their Menu but no such luck. Walleye Wings can be fried or baked, but grilling them is a quick, easy way to cook them. Be sure to rub liberal amounts of olive oil on them to prevent them from sticking to the grill, and leave the grill lid open to watch for flare ups. • salt and pepper or season with a little Alpine Touch and Cajun or your favorite seasoning. Dip in Drawn Butter. 1. Lather the walleye wings in olive oil to prevent them from sticking to the grill grates. 2. Place the wings on a medium-temp grill and leave the hood open to watch for flare ups. 3. Grill for a couple minutes on each side, then remove once the fins start to become burned. 4. To eat, treat the fins like a tooth pick and bite down just above them to pull the flaky meat off.